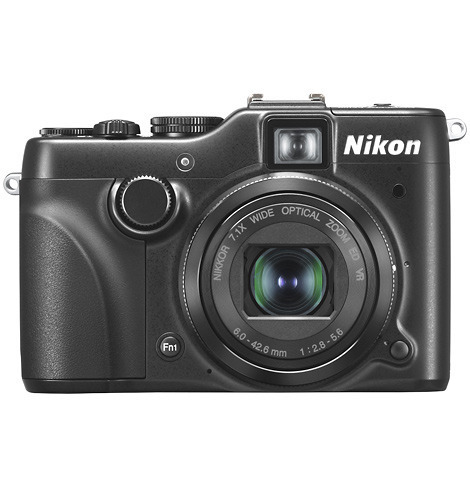 A premium compact digital camera built for serious photographers and pros, the Nikon P7100 has dual exposure control dials, a 7.1x zoom lens (28-200mm equivalent) with optical VR, 720p HD video with stereo sound, RAW shooting, an optical viewfinder and a flash hot shoe. This is the camera you take with you when you don't want to carry your DSLR but you don't want to make any compromises. DSLR-level creative / manual control including RAW. Excellent images including low light. Bright, large, variable angle TFT screen. Viewfinder not particularly useful and perhaps not worth added size / weight. For my purposes would be nice for menu structure to duplicate that on my D90. For that and other reasons I had occasional frustration getting the settings I wanted. If you care about movie quality HD is only 720p. If you have a sensor size fetish it is only 10.1MP. Nikon describes the P7100 as a "compact companion to your DSLR that's perfect for roadtrips and vacations" and that is what they delivered. Full creative control - one camera-top dial give instant access to ISO, white-balance, picture quality (including RAW), picture control menus plus a customizable "my menu"; another set exposure compensation + / 1 three stops. Shutter speed and aperture set using front and back dials just like my D90. Lens optical zoom is 28 - 200 equivalent, aperture f/2.8 - 5.6. Has a hot-shoe so you can use a real flash. Has a variety of auto-focus modes including user-selectable AF point. Has an HDR feature that I have not tried. I could go on but you get the idea. I used the P7100 as my walk-around camera during a 2-week road-trip around central Europe. It fits easily in a jacket pocket (where you won't notice the size weight) or a large pants pocket (where you will). I thought I would be glad for the viewfinder (aging eyes need reading glasses to use the screen) but ended up not being very useful except in bright sun and on auto settings - unlike a DSLR the viewfinder provides no shooting information. Might be worth the size/weight savings to eliminate it. The screen is bright and saturated, love the tilt feature; the camera has a very solid build and nice hand feel. Photo quality was outstanding, nothing jumped out to distinguish photos I took with the P7100 from those I took with the D90. I took it into several cathedrals and was especially please with its low-light performance. ISO settings go up to 3200 plus "Hi-1" which goes into metadata as 6400, got some very nice shots on that with noise that was noticeable but not bothersome. Worth noting that mid-trip the camera was with me for a slight canoeing mishap and was completely immersed for 15-20 seconds. After 3 days of drying (mostly on the car dashboard while driving) it was up and running again with no effects I have noticed. I did not looks at competing brands (e.g. Canon G12) because my primary camera is a Nikon and I assumed a Nikon would maximize menu / control and other compatibility. Overall I love the camera and looking forward to doing a lot of shooting and experimenting with it. Prior P&S was Canon Powershot A620.